~Guest Post~ Tanya’s VBAC story……. Tanya is one of my closest and most dearest friends. It helps that we both have two boys the same ages and that we just get each other as moms! She is the friend i confide in most and i know our journey as moms only intensifies the depth of our relationship. As it turns out she is an incredible writer. She has a beautiful way with words as is evident here. By the time Jack’s due date came along, I’d been planning my VBAC for 2 years and 10 months; the second my first child was born via Cesarean. During that wait, the need for fulfilling what felt like a rite of passage became a yardstick against which I measured my strength and ability as a woman. Selfish and completely insensitive (especially with my own mother who tried and failed for 7 years to have her own baby and adopted me). How must she have felt to hear me distraught that I couldn’t give birth in this way when she couldn’t even get pregnant? And here I was defining my “success as a woman” by this. But these were my raw, honest feelings. Anyone else who had not been able to have a vaginal birth never ever registered on this judgement scale of mine. Only me. With my first pregnancy, when I thought I was in labour and went to the hospital my cervix was unable to be found. Wherever a missing cervix goes on an occasion like this is anyone’s guess, but the midwife was stumped as not once in 48 years of practice had she ever not been able to locate this vital component of a pregnant woman’s anatomy. His head was floating and it was concluded that a Cesarean was the only option. I didn’t know any better, had not armed myself with the literature that would tell me how to do it my way. 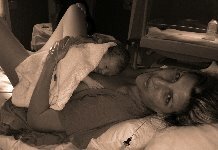 For the next 2 years I played the scene of my failed labour over and over in my head like a scratchy record, trying to find peace with the fact that a vaginal birth would never have been possible. Perhaps if I had just asked them to let me try for another 12 hours … Surely if I’d been more patient or insistent or strong. I couldn’t stop obsessing over the what ifs. Finding a Gynae who is prepared to allow you a VBAC is where I am certain the proverb needle in a haystack originates. But by chance my Gynae was completely on board. He saw no problem in my ability to have a vaginal delivery but said that numerous factors had to all be lining up on the day in order for me to be able to do so. As with my first labour, when my contractions started at 3am I waited like a kid on Christmas for them to pick up in intensity and rhythm. By lunchtime that day they had petered out completely, convincing me that my body was copying the blueprint of my previous experience. Eventually at midnight that night they picked up again until they were sore enough to justify a hospital visit. When the midwife located my cervix I felt like I’d already turned a huge corner. Even though baby’s head was moving onto and off of my cervix, causing irregular contractions, she assured me that progress was being made. I went home to labour and at 3am my contractions entered a zone that knocked me to the ground with their intensity. Queue primal screams coming uncontrolled from that animal part inside of a person. We drove back to the labour ward while I had the screaming in the car experience I’d secretly longed for; just like in the movies and not nearly as fun to act out in reality! The midwife looked at me wide-eyed and immediately ushered me inside. I was told I was 2cm dilated and opted for an epidural as I knew I had a long day ahead of me. I didn’t want exhaustion or pain to compromise this chance for a much dreamt of birth that was opening up to me. My Gynae came to break my waters at 8am and declared confidently that I was officially in active labour. By 11.30am I was 5cm dilated and suddenly at 12.30pm, one hour later, I felt intense contractions starting up again. I called the midwife concerned that my epidural was wearing off but when she examined me she found that I was fully dilated and said I was having pushing pains. My baby’s head was still not down properly yet but she assured me I would be pushing my baby out soon. As she started preparing the cot and the instruments for the delivery in the room, my tears of absolute amazement started flowing. I never thought I would get this far. The surreality of what had transpired was too enormous to unpack. 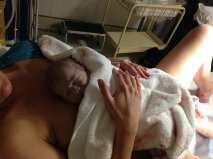 My Gynae arrived 2 hours later and after 10 minutes of pushing and a bit of help from the ventouse machine my baby’s head was born. I reached down and touched his perfectly warm head and tiny little ear and as the rest of his body slipped out with one final push, I felt the purest sense of relief, release and consummation. I felt peacefully powerful; a truly personal power devoid of arrogance or pride. A cathartic and healing serenity within me that I still feel a year and a half later.